This was not a prearranged meeting. The ‘showroom’ door was not open when I arrived, but, when I looked into the window of his workshop, he immediately opened the door and welcomed me into a room full of the smell of wood, and an amazing array of tools. He was keen to show me around and tell me his story. Santi went to the art school in Anghiari which, at that time, specialised in woodwork and restoration of antique furniture. (This specialisation has now been discontinued.) He had thought that clay would be his medium, but, through a life changing teacher, found his passion for wood. He spent time during summer holidays in the teacher’s workshop, and then worked with him once he had finished school. For a while after that he worked with his woodworker uncle who, like many, had a small workshop in the medieval part of Anghiari. They parted company because, according to Santi, the uncle was stuck in his ways, didn’t believe in any change. It was in the ’80s that Santi set up in his current place, located on one of the main roads into Anghiari, with a great view across to the medieval town (and where his uncle’s workshop had been). Santi’s workshop had been that of his father who had been a motor mechanic. He died when Santi was only 3 and, so, he said ‘Sadly, I never knew him’. With his mother and siblings he lived above the workshop, in the house where he and his wife now live. Although bitterly cold outside today, the sun was streaming into the workshop. It felt like a very inviting place in which to work. In the space itself, you could feel Santi’s love for his work. And this is what came across most clearly in our conversation – that he lives for his work. He told me that his life is not organised around separations between work, home, bar. And he certainly doesn’t work for money; he accepts the fact that people don’t much want this sort of furniture these days. He’ll just continue working at what he loves. One of the upsides of the internet, he said, is that his work is getting to be more widely known, and that young people are coming from all over Italy (eg from Sicily soon) to study with him. They get theory in art schools, he said, but they come here for the practice. 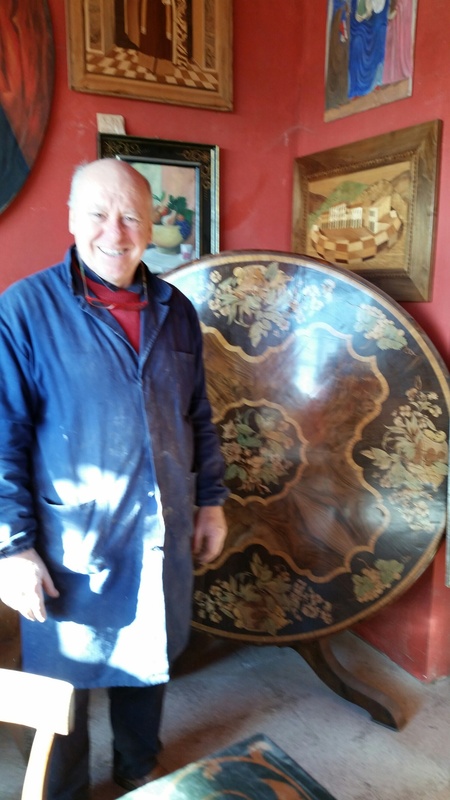 I can imagine that Santi’s practice would be an inspiration to students: the care he takes for his tools and materials; the skill involved in making such beautiful pieces; but, above all else, perhaps, his ‘joy’.